Everything Under is a beautiful book. Sentences twist and burble with an elegance that nonetheless feels etched in stone. That old stories can turn so neatly within a modern world brings a sense of connection to myth, to the land, to the fallibility of supposed progress. Gretel is a lexicographer, updating dictionary entries. A call from a morgue tugs at her forgotten past and sets her on a quest to find her mother and uncover what happened all those seasons ago. They lived on the river once and shared a language of words forged to suit only themselves. They spoke of what frightened them as the Bonak. As Gretel wanders closer and closer to the land of her childhood, she finds another missing person whose story is curled tightly within her own. It feels wrong to tell out the plot because once you know it, there is an inevitability to it that cannot be unlearnt, and yet in the reading there is mystery and discovery. Many reviews name the ancient tragedy Everything Under retells, but I don’t want to do that either. There is more than one story working within the novel and even then, you can read the book without hearing them churning underneath this story. There is no intellectual snobbery, no forced connection, but an unfolding that suggests the way all narrative weaves, all stories wash up sea changed but ready to be heard again, at their root a fear of chaos and death, the monster that shows the way, the Bonak that is every child’s worst bogeyman hiding in the dark. The world of the river, that can flush its secrets out into the ocean, feels far removed from the civilised world of roads and houses, of police, hospitals, libraries and supermarkets. It is an enticing, feral world that subsists in ancient rhythms. Laced over this world are cancer, dementia, linguistic sophistication, the power of narrative, alongside transgender, transvestism and fortune telling. 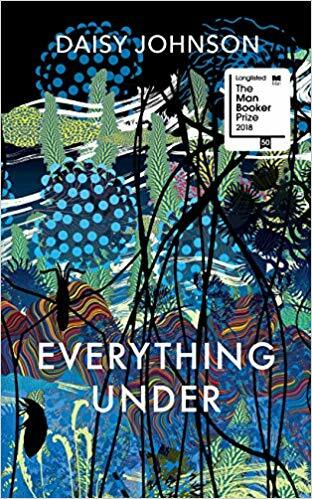 Everything Under is a novel rich with story and thought, a gingerbread house fit for hordes to gorge on. It would be hard not to love this book. 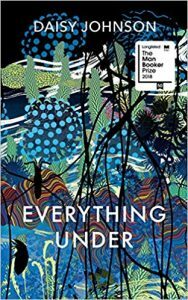 On the long list for this year’s Man Booker, Everything Under is a book that cries out to be read.